> Review of the 2-star Hotel San Giorgio, a decent budget place to stay. 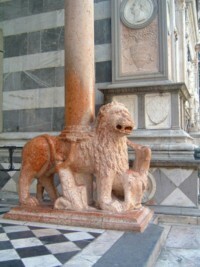 Bergamo is a pleasant weekend break destination in Lombardy, northern Italy. The attractive town is close to Milan, and popular with the Milanese who want to breathe some fresh air outside the city. Budget airlines use the airport as a gateway to Milan. The town is to the north-east of Milan, and is also close to Lake Como. Bergamo is situated where the northern Italian plain meets the foothills of the Alps, so as well as offering fantastic views, it's also a gateway to completely diverse tourist regions. 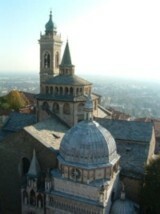 Bergamo is a town of two halves, the upper hillside town (Bergamo Alta) and the lower town (Bergamo Bassa). Like many Italian towns, the attractive older settlement is at a higher level than the newer developments, which are based around the town's railway station. A funicular links the two towns. Bergamo old town has many good eating-places, bakeries and take-aways - and also a generous selection of shops selling speciality foodstuffs and mouthwatering pastries and delicacies. There are a couple of convenient tourist information offices in Bergamo: can be found one in a block immediately in front of the railway station, the other in Via Gombito between the Piazza Mercato delle Scarpe (where the funicular arrives) and Piazza Vecchia. Milan Bergamo airport is named Aeroporto Orio al Serio, after its location. Its IATA code is BGY. This is a busy international airport served by a number of airlines, with flights all around Europe. Ryanair fly to Bergamo from several destinations in the UK and Ireland, including London Stansted, Bournemouth, Liverpool, Glasgow, East Midlands, Bristol, Manchester, Dublin and Shannon. The airport is quite small. The shuttle buses for Milan and Bergamo are well signposted in the arrivals hall and can be caught just outside. They set passengers down at the same stops: for departures: you simply go into arrivals and turn right for the departures hall. You can still get basic, good-value snacks and drinks after passing through security. The bigger such place, with a few tables and chairs, is upstairs by Gate 9 - and you can you can go there first even if you are being signposted through to Gates 1-5 on the ground floor. Once through the separate passport check for these gates, there's a second and smaller food point by Gate 1. Frequent bus services run from the airport to Milan and to Bergamo. A company called Autostradale operate a half-hourly coach service to Milan's main railway station, Stazione Centrale. Travel from Bergamo Airport to Milan costs €8.90 one way, or €16.50 for a return. The journey takes around an hour; buy your ticket at the Autostradale office or online in advance. Occasional services also stop at Milan's Lambrate station. Another company, Orioshuttle, also connect Bergamo Airport with Milan Stazione Centrale; they run more irregularly, but mean that you should never have to wait long at the airport for a bus into Milan. Ticket prices are similar to their competitor's. Autostradale also operate a a coach service five times a day to Brescia which stops at the bus station alongside Brescia railway station. This journey takes an hour and costs €10. 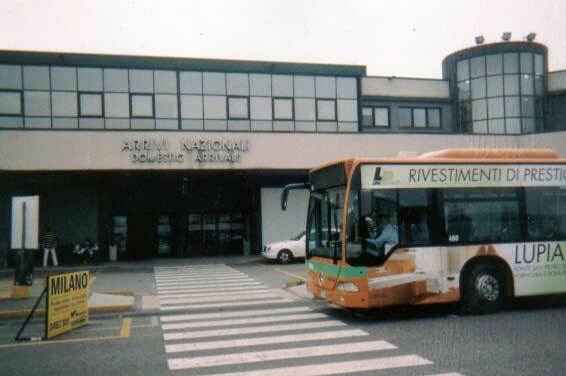 The public bus service from Bergamo Airport into Bergamo runs every half-hour and costs €1.65 each way. Run by local firm ATB, the bus takes just 10 minutes to reach Bergamo railway station, before continuing towards the historic centre. There are a range of other tickets which may interest travellers: for example, a €3.50 1-day ticket for Bergamo public transport including a return on the airport bus, or a 3-day version for €5. You can buy tickets at the airport ticket office, the bus station and from ticket machines. Bergamo is an hour by train from Milan, and there are also frequent trains to Brescia. Trains between Bergamo and Milan are approximately hourly; tickets cost around €4 each way. Some trains run to the main Milan railway station, Stazione Centrale, and others to Stazione Porta Garibaldi. Buses from the bus station in Bergamo (near the railway station) run to Milan, Como and other local destinations. Travelling around within Bergamo is quite easy on foot, but the town also has a good bus network. A funicular connects the lower town with the Città Alta - from the station walk straight ahead towards the hill where you can see the Città Alta, for about 15-20 minutes. The funicular station is on Viale Vittorio Emanuele II, where the road bends around the foot of the hill. Alternatively, from Bergamo station, the number 1 bus runs to the funicular, and then on the furthest part of the Città Alta, by the second funicular to San Vigilio. You can buy tickets from bars or machines, and stamp them when you travel. The best option is a one-day ticket (a biglietto giornaliero), which costs €2.50 and is valid on buses and funiculars - just stamp it the first time you use it. See above for the good-value ticket options including airport travel.